Vintage color palettes. Art nouveau era. National parks and wildlife observations. My name is Jeff, I’m a San Diego native who enjoys the outdoors and endless pursuit of artistic exploration, in a multitude of mediums. 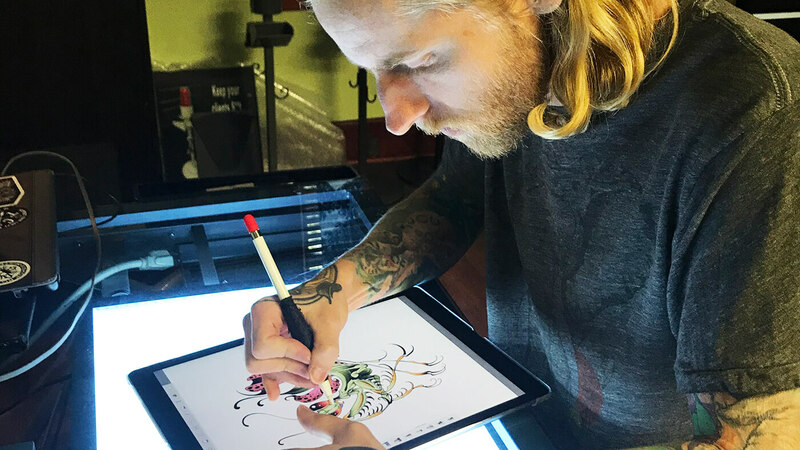 Over the years I’ve done everything from automotive restoration and part fabrication, woodworking, bonsai, and wire-wrap sculpture – to what I’m currently best know for; oil painting and refined tattoo designs. Although I don’t practice some of my early artistic pursuits, I was taught at a young age the importance of attention to detail and craftsmanship. I draw inspiration from visiting national parks and wildlife observations. I’ve always been attracted to vintage color palettes, and the art nouveau era that emphasizes beauty in shape, and constant fluidity. My styles can best be described as illustrative realism as well as dotwork/ornamental linework. I firmly believe a great stylized tattoo starts with a bold foundation that compliments the shape and contour of your body so it appears to move with you, and never distort. I feel my work is most striking when I’m given a vague or simple concept, and allowed artistic freedom to explore the ideas you present. The result is a dynamic, defined illustration that will draw attention from friends and strangers alike. I always keep in mind what the tattoo will look like over time, and from a distance. Ideally, I want someone on the other side of the street to able to clearly see your design and interpret the subject matter. Tattoos are a commitment, and they age with our bodies. I take a unique approach to layer shadows and color, creating contrast, so your healed tattoo looks just as striking as the day you got it done! Before starting on a project, I prefer to meet with you if you’re local to Southern California. By setting up a consultation, we can both sit down to collaborate and go over what you’re looking for – I’ll usually draw a sketch, while you watch, to layout the overall size, shape, and elements within the design. This process ensures we are both at a starting off point that we are happy with, and that incorporates what you’re looking for in your next piece of artwork. During the day of your appointment, I’ll have the stencil, as well as a full color render of your design layered on a photo of your body. This way you can see what the finished tattoo will look like before we even start. I can usually make design alterations on the spot if we agree some adjustments are needed before getting started. Every line I put into a design has meaning and impact on the overall feel. Synergy is something that never goes overlooked, as I will usually draw multiple renditions of a design before finding the feeling I want the piece to convey. Every tattoo I make must be something I’m proud to have been part of creating.